Director Ron Howard's latest effort, FROST/NIXON explores the story behind the most watched television interview in history - the interview of resigned President Nixon by British television host/personality, David Frost. Howard explores the untold story behind the formulation of the contract between the two and each man's motivations for doing it. Somewhat surprisingly, Howard chose composer Hans Zimmer to provide the musical backdrop for the film. I say "surprisingly" because of the type of film FROST/NIXON is. This isn't a suspense thriller like THE DA VINCI CODE or ANGELS AND DEMONS, where the talents of ZIMMER make good sense. Instead it is very intimate presentation; almost on an indy-film level. It's a film that just doesn't immediately evoke the thought of HANS ZIMMER. In the end, those who were of age to remember the Frost-Nixon interview (and old enough to understand and care), this film will likely be of high interest. 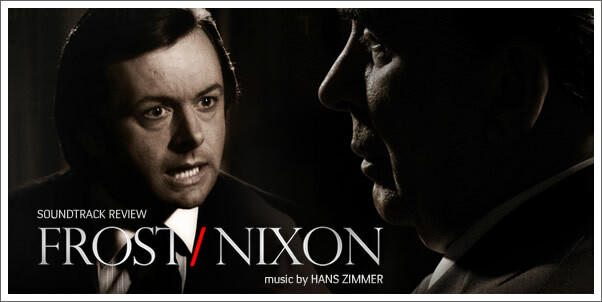 For those outside of that population, FROST/NIXON might be difficult to connect to and Zimmer's aptly subdued score is unlikely to push the masses to go out and grab this soundtrack either.